I love bright, cheery pastels for spring, so I chose Essie – Fashion Playground for the base polish. I decided to go with daisies, the quintessential spring flower. Even though I needed a bright white polish to paint the daisies, I wanted the accent nails to be a soft white, so I used Essie – Allure for the accent. Fashion Playground went on my index, middle and pinky fingers, then 3 coats of Allure on my thumb and ring finger. I topped my thumb and ring finger with China Glaze – Make a Spectacle, then went on to paint the daisies. 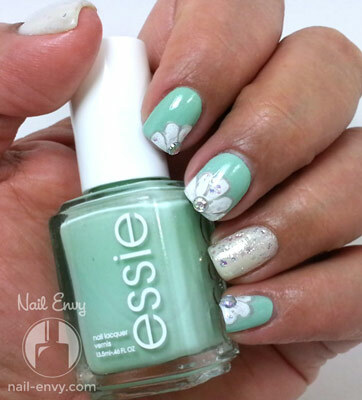 Using a small rounded nail art brush, I painted the daisy petals with Salon Perfect – Sugar Cube. Sugar Cube is fairly opaque in one coat, so this is a good white polish to use. I used a very thin nail art brush to add a stroke to the petals with Zoya – Dove. Adding the stroke in grey was a little tricky, but I like the definition it adds to the simple flower. I topped all of my nails in Seche Vite, then added large rhinestones for the daisy centers. That's it! Now I’m all blinged for spring! From Katherine: These are so perfect for spring, aren't the flowers lovely? And I adore any look that makes use of CG Make a Spectacle! Emily is so wonderful for being willing to support me with this guest post, be sure to share the love back with her by visiting her on instagram, facebook and twitter! I'm glad you didn't skip on the bling…this is gorgeous! So cute! And very springy. Those daisies are great! I love this it's so perfect for Spring! Such a pretty design and I love the bling touch! Love this design for the Spring, very cute! So so so pretty, Emily! I love the bling!! Gorgeous nails and I love that Essie for a base!!! That's pretty! That blue is nice. This is freaking beautiful! I may need to pin and add it to my "mani's to try" list! I love it! It's so pretty! Everything ties together so well, I love it!